A pseudo-object is an abstract object, accesses to which are translated to calls. The pseudo-object expression has a syntactic form, which shows how the expression was actually written in the source code, and a semantic form, which is a series of expressions to be executed in order which detail how the operation is actually evaluated. Optionally, one of the semantic forms may also provide a result value for the expression. If any of the semantic-form expressions is an OpaqueValueExpr, that OVE is required to have a source expression, and it is bound to the result of that source expression. Such OVEs may appear only in subsequent semantic-form expressions and as sub-expressions of the syntactic form. 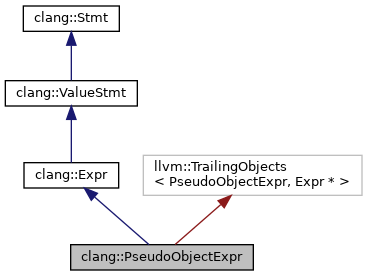 PseudoObjectExpr should be used only when an operation can be usefully described in terms of fairly simple rewrite rules on objects and functions that are meant to be used by end-developers. 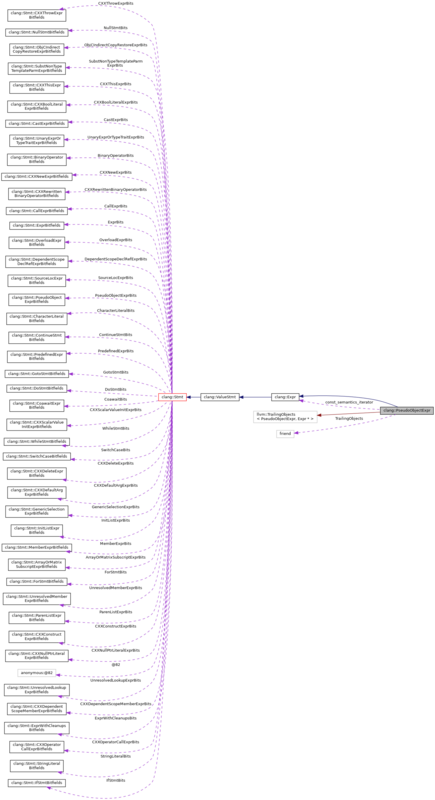 For example, under the Itanium ABI, dynamic casts are implemented as a call to a runtime function called __dynamic_cast; using this class to describe that would be inappropriate because that call is not really part of the user-visible semantics, and instead the cast is properly reflected in the AST and IR-generation has been taught to generate the call as necessary. In contrast, an Objective-C property access is semantically defined to be equivalent to a particular message send, and this is very much part of the user model. The name of this class encourages this modelling design. Definition at line 5511 of file Expr.h. Definition at line 5578 of file Expr.h. Definition at line 5577 of file Expr.h. NoResult - A value for the result index indicating that there is no semantic result. Definition at line 5543 of file Expr.h. Definition at line 5618 of file Expr.h. Definition at line 5624 of file Expr.h. Definition at line 5630 of file Expr.h. Definition at line 4127 of file Expr.cpp. References clang::ASTContext::Allocate(), clang::Expr::containsUnexpandedParameterPack(), clang::Expr::Expr(), clang::Stmt::ExprBits, clang::Expr::getObjectKind(), clang::if(), clang::Expr::isInstantiationDependent(), clang::Expr::isTypeDependent(), clang::Expr::isValueDependent(), clang::OK_Ordinary, clang::Stmt::PseudoObjectExprBits, clang::ast_matchers::type, clang::VK_RValue, and clang::ASTContext::VoidTy. Definition at line 4113 of file Expr.cpp. References clang::ASTContext::Allocate(), clang::Expr::Expr(), and clang::Stmt::PseudoObjectExprBits. Definition at line 5611 of file Expr.h. Definition at line 5614 of file Expr.h. Definition at line 5607 of file Expr.h. Definition at line 5575 of file Expr.h. Return the result-bearing expression, or null if there is none. Definition at line 5566 of file Expr.h. Referenced by emitPseudoObjectExpr(), and shouldEmitSeparateBlockRetain(). Definition at line 5571 of file Expr.h. Return the index of the result-bearing expression into the semantics expressions, or PseudoObjectExpr::NoResult if there is none. Definition at line 5560 of file Expr.h. Definition at line 5599 of file Expr.h. Definition at line 5603 of file Expr.h. Return the syntactic form of this expression, i.e. the expression it actually looks like. Likely to be expressed in terms of OpaqueValueExprs bound in the semantic form. Definition at line 5555 of file Expr.h. Referenced by getBestPropertyDecl(), getSyntacticFromForPseudoObjectExpr(), isImplicitThis(), clang::Expr::isUnusedResultAWarning(), and clang::Sema::recreateSyntacticForm(). Definition at line 5556 of file Expr.h. Definition at line 5592 of file Expr.h. Definition at line 5595 of file Expr.h. Definition at line 5579 of file Expr.h. Definition at line 5582 of file Expr.h. Definition at line 5585 of file Expr.h. Definition at line 5588 of file Expr.h. Definition at line 5635 of file Expr.h. Definition at line 5634 of file Expr.h.